The New Zealand king shag is endemic to New Zealand, only occurring in the Marlborough Sounds. Subfossil bone deposits indicate two regional haplogroups, from the Cook Strait region and northern North Island. However, king shags have been confined to the outer Marlborough Sounds for at least 240 years. European naturalists first encountered king shags when J.R. Forster collected one in Queen Charlotte Sound during Captain Cook’s second visit to New Zealand, in May 1773. The king shag is a large black-and-white shag with big pink feet. The black feathers on forehead, crown and nape extend to just under the bill, making king shags appear ‘dark-headed’ compared to the similar-sized pied shag. The dorsal area of mantle, scapulars, back and tail are black apart from adults, which have a white patch or stripe near the leading edge of the inner wing. Some birds also have a white patch on the upper back. The white scapular feathers are prominent on roosting birds, creating an elongated white patch in the middle of the otherwise black folded wing. Breeding adults have a patch of sulphur-yellow warty ‘caruncles’ on each side of the upper bill base; the size and colour intensity of these is reduced at other times of the year. 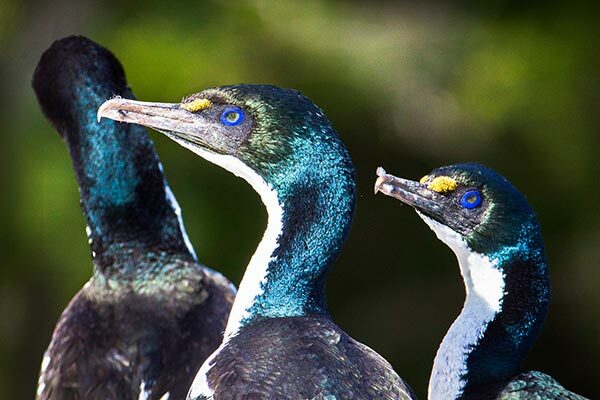 The cobalt blue eye-ring (not part of the eye) is shared with other pink-footed ‘subantarctic’ shags, providing this group with the generic, but technically incorrect name “blue-eyed shags”. Juvenile birds differ from the adults in having dull brown upper parts (rather than black) and pale facial skin. Voice: croaking bursts of low frequency sounds, more noticeable during the early morning. Similar species: pied shags are similar in size, but have a predominantly white face, with the eye surrounded by white feathers; they also lack any white feathers on the upper wings and back. Pied shags are also slimmer, compared to the thick-necked look of king shags. Pied morph Stewart Island shags are very similar, but are not known to overlap in range. They differ in having a more slender bill and orange (cf. yellow) caruncles when breeding. King shags are restricted to the outer Marlborough Sounds, from the west coast of D’Urville Island east to where Queen Charlotte Sound and Cook Strait meet. About 85% of all existing birds are located at five colonies: Rahuinui Island, Duffers Reef, Trio Islands, Sentinel Rock and White Rocks. The area occupied is defined by the distance and direction from the colonies and the water depth contour. The shags feed up to 25 km in a predominantly southwest direction from the main colonies, mainly in waters up to 50 m deep (but diving in deeper waters has been recorded). The foraging area of king shag is estimated to be 1300 km2. Away from the Marlborough Sounds, there are records of single king shags from Wellington Harbour (July 2002), and Kaikoura (October 2011). 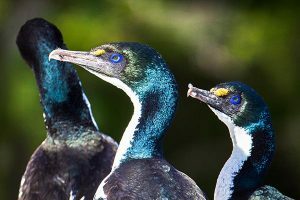 In 2015 and 2016 seven individual king shags, mostly 1st and 2nd year birds, were recorded from Abel Tasman National Park. King shags breed on low rock plateaus (Duffers Reef and Stewart Island/Tekuru Kuru), steep rock faces (Trio Islands and White Rock) or rock ridges (Sentinel Rock and Rahuinui Island). King shags breed between 2 and 33 m above sea level, with 80% of the population breeding lower than 14 m above sea-level. The king shag population was assessed to be 839 birds (including 187 pairs) based on aerial surveys in 2015. Although the status of the king shag has been assessed to be stable, this is based on limited data. A 2016 survey showed a more than 37% decline in active breeding pairs compared to 2015. The restricted distribution and small population size of king shags means that a single adverse event, such as an oil spill, could impact most of the population. Other risks include coastal eutrophication through multiple anthropogenic stressors (e.g. aquaculture, forestry and riverine nitrogen inputs) impacting the deep benthic communities where the shags feed, and/or causing toxic algal blooms that may directly or indirectly kill individuals. Adverse weather events may also have an effect on king shags. The loss of 58% of nests at White Rocks in June 2015 was very likely caused by exposure to southerly storms. It is not known whether king shags lay replacement clutches. King shags are vulnerable to disturbance at their colonies, and use of set-nets (particularly in close proximity to colonies). Most king shag breeding activity occurs during winter. Nests are platforms of sticks and seaweed, cemented with guano. The 1-3 pale blue eggs are usually laid in May-June. There is no information on incubation length or nestling period, but juveniles are present at colonies from July onwards. Adults (likely females) feeding chicks depart colonies at sunrise, arriving back at the colony about midday. A second departure happens short after midday (likely males). King shags are difficult to study due to their inaccessible breeding sites and sensitivity to disturbance. Most studies have been boat-based, looking at patterns of bird movements to and from colonies, and activity of king shags around marine farms. A low number of pairs attempt to breed each year, and so it is possible that not all birds are annual breeders. King shags are deep divers, feeding on bottom-dwelling fish species. About 90% of feeding birds are recorded foraging in water depths down to 50 m. Prey species for king shag reported up to 2003 were: witch (Arnoglossus scapha), opalfish (Hemerocoetes sp), lemon sole (Pelotretis flavilatus), other sole species (Peltorhamphus sp. ), flounder, (Rhombosolea sp. 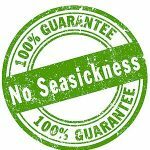 ), leatherjacket (Parika scaber), blue cod (Parapercis colias), sea perch (Helicolenus percoides), red cod (Pseudophycis bachus), red scorpionfish (Scorpaena papillosus), pilchard (Sardinops neopilchardus), New Zealand sole (Peltoramphus novaeseelandiae), sandfish (Gonorhynchus gonorhynchus), triplefins (Tripteriigydae) and spotty (Notolabrus celidotus). The predominant prey in a more comprehensive 2011 study were: witch, lemon sole and opalfish. Dwarf octopus (Octopus sp.) was recorded as new prey species in 2011. All the preferred prey items are bottom-dwelling species, highlighting the king shag’s deep diving abilities and dependence on a healthy benthic environment in the deeper waters of the Marlborough Sounds.